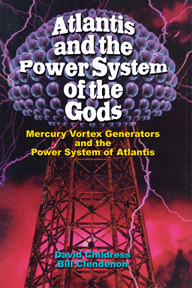 ATLANTIS AND THE POWER SYSTEM OF THE GODS starts with a reprinting of the rare 1990 book MERCURY: UFO MESSENGER OF THE GODS by Bill Clendenon. Clendenon takes on an unusual voyage into the world of ancient flying vehicles, strange personal UFO sightings, a meeting with a ''Man In Black'' and then to a centuries-old library in India where he got his ideas for the diagrams of mercury vortex engines. The second part of the book is Childress' fascinating analysis of Nikola Tesla's broadcast system in light of Edgar Cayce's ''Terrible Crystal'' and the obelisks of ancient Egypt and Ethiopia. Includes: Atlantis and its crystal power towers that broadcast energy; how these incredible power stations may still exist today; inventor Nikola Tesla's nearly identical system of power transmission; Mercury Proton Gyros and mercury vortex propulsion; more. Richly illustrated, and packed with evidence that Atlantis not only existed--it had a world-wide energy system more sophisticated than ours today. --The Ramayana and the amazing vimanas of ancient India; --Atlantis and its crystal power towers that broadcast energy; --Inventor Nikola Tesla’s nearly identical system of power transmission; --How gyros with electrified gas or liquids—plasmas—can have an anti-gravity effect; --Mercury Proton Gyros and mercury vortex propulsion; --The Crystal Towers that broadcast energy to the lost continent of Atlantis; --How these incredible power stations may still exist today; --The Earth as a giant power plant ; more. ATLANTIS AND THE POWER SYSTEM OF THE GODS: Mercury Vortex Generators & Tesla’s Wireless Power by David Hatcher Childress with Bill Clendenon. 246 pages. 6x9 Paperback. Illustrated. References.